Max’s birthday is September 22. But since Yom Kippur fell on that day this year (the Jewish calendar is lunar), we observed his 5th birthday a week later. Warming me up for a senior portrait session at Bandemer Park. Thanks to a great experience at a friend’s party at Jungle Java, Max unequivocally chose this high-octane habitrail-for-kids as the venue for his party. And Baker’s Nook in Saline deliciously fulfilled Max’s vision for a monkey themed cake. 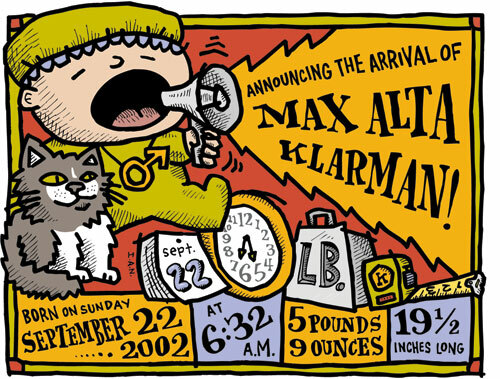 Around this time in 2002, we commissioned Ian Nagy to design Max’s birth announcement. Megaphone? How did he know Max’s instrument of choice would be a megaphone? Seated beside Max is our cat Phoebe, whom we miss dearly. Also, in case anyone is wondering, Max’s middle name is in honor of the Alta Ski Area in Utah. If you’ve ever shredded the powder at Alta, you’d understand! Design and illustration by Ian Nagy. as we say in Hebrew: Mazal Tov and Yom Huledet Sameach! 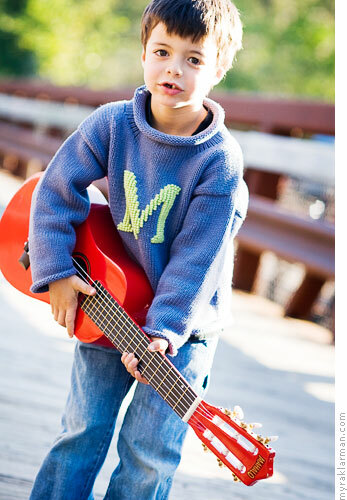 he looks very cute and share the same age with my daughter, Or.